We deliver results check our Client's Testimonials. Call us at: 613-796-1449. Relocating to Ottawa, Military relocation, we've got you covered. We would to thank you for your help. Me and my wife enjoyed working with you. You were always available to answer our questions, explained everything in details, transparent and you always put the customer satisfaction as the priority. Thank you again for all your support and hard work - don't see many people acting as professional and caring as you do! We are extremely impressed with your work. At first we tried selling our house ourselves but it wasn't very convenient and we felt a lot of stress and pressure. Then we met you guys and you took that stress and pressure away from us. You took care of everything, you were always available to answer our questions and concerns, we receive all the possible support from you and a lot of great advices. We were always kept informed of any changes by text, email or phone. 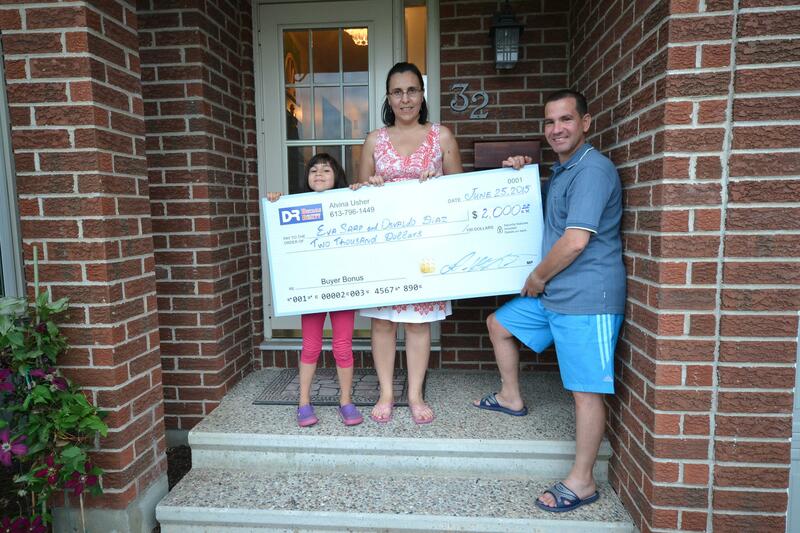 With your incredible work the home visits more than doubled and our house sold very fast. Extremely impressed with your support, your team work and your outstanding professionalism! Sébastien, Stacey and the kids. We found our dream house last August and needed to sell the beloved home we'd grown out of. We decided to try selling privately on our own and did everything we were supposed to do to get our house to list. We held open houses every week and had lots of visits, but no serious buyers. With the slow season approaching, we knew we needed professional help. We held a number of interviews with potential realtors to find the best fit for us. 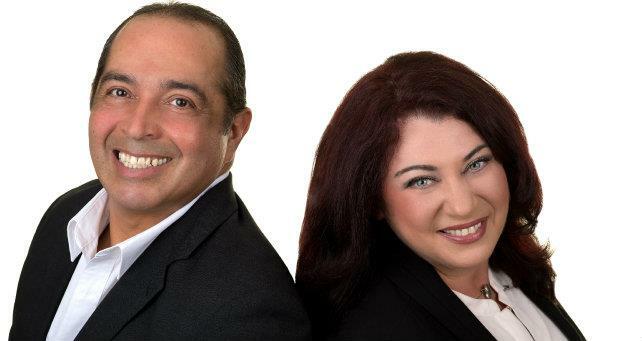 We chose Alvina and Dan because we liked the idea of having two realtors working as one, they were dynamic and they talked about what they could offer us (with their track record as proof) instead of telling us why they were better than other realtors out there. Our house sold within 8 weeks, and in the lead up to that happy day, Alvina and Dan were always professional, followed through on their commitments without the need for follow-up from us, were honest and frank about what to expect (they take their business seriously but with compassion), and was available for us always - taking our calls, texts and emails - even while they were on vacation out of the country. We would highly recommend Alvina and Dan! When I have separated and moved to a rental property - my dream was having my own house for me and my kids. Alvina and Dan helped me to find a perfect place for my family. Dan helped a lot with after offer questions " Where do I find a good inspector? lawyer? what should I do with that and that problem....?" I am really happy with my new house which is not big but perfect size for my family and fits my budget - which is really important. Great experience with Alvina. Knowledgeable and a good listener. Excellent qualities that carried us through 4 months of looking for a new house, buying it and selling the old one. She is very organized and efficient with a good eye for the best deals. We never had to wait long for a showing or an answer to a text or a phone call. Would recommend her to anyone who is willing to pay the commission for the real value service. As a military family you practically need a miracle to be able to have a successful house hunting trip in the short amount of time provided and purchase a home you love instead of just settling for the first one you see. 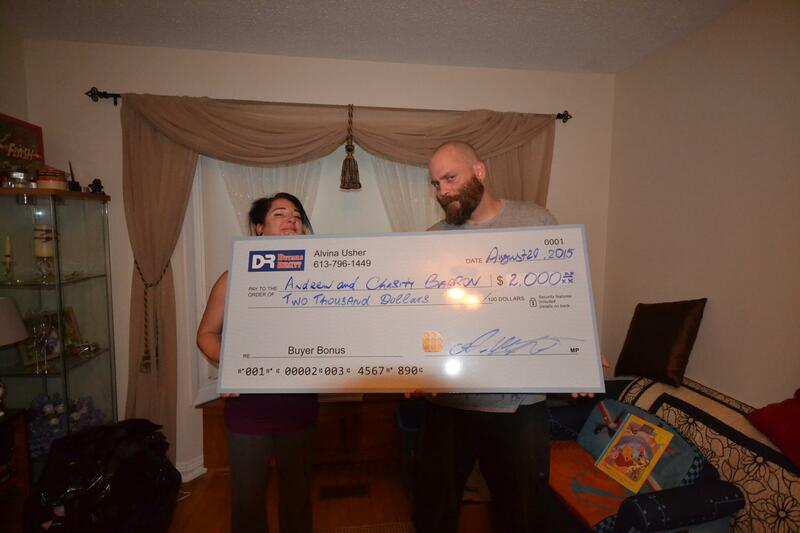 Alvina from Details Realty Inc. was that miracle for us. During the initial viewings her organization skills helped us weed out the homes we knew we wouldn't like which saved us very precious time. Even before our offer was accepted she had the inspection pre-book, lawyer ready both of whom were on the third party list and put us in contact with a great mortgage specialist to finalize our finances. Her hard work is what enabled us to win our home which already had an accepted offer. If you are a military family who is selling or buying you want her working with you and not on the other side of the offer. 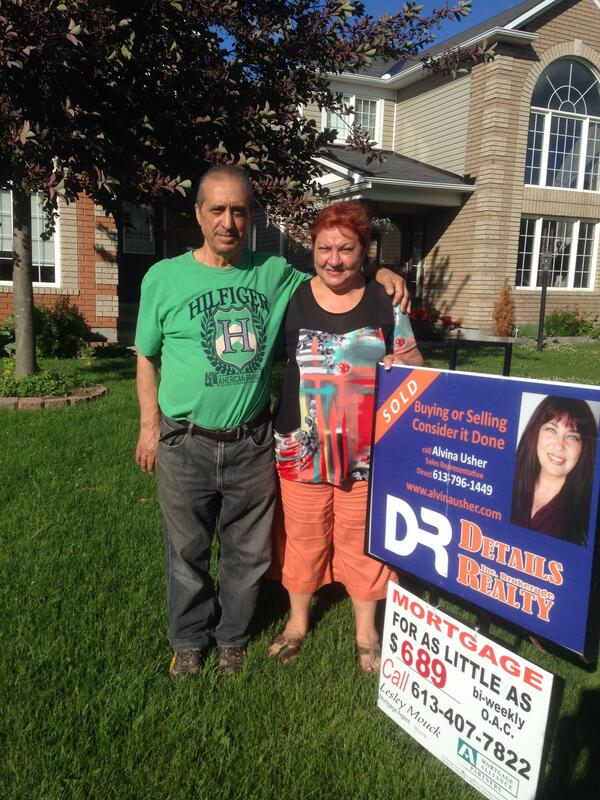 As a first-time home buyer, I was very fortunate to have Alvina on my team. 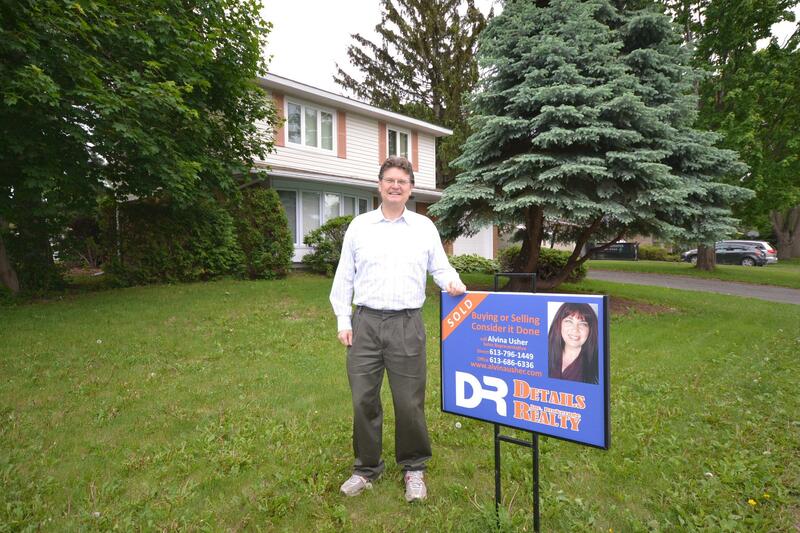 She worked with tireless energy, professionalism and dedication on a very complex sale. She left no rock unturned made sure my interests were protected and offered so much support throughout the process. I highly recommend Alvina to anyone who is serious about buying or selling a property. Our experience with Alvina and Dan as our agents was exceptional Through their expertise and guidance, we sold our home in 10 days! I would not hesitate to recommend them to anyone. Thanks so much for your help in selling my home. After 5 weeks on Grapevine with no activity other than agents I was fortunate to meet you. You recognized that I had a marketable product and spent a lot of time with me on your first visit discussing the market. I loved your direct, respectful and no-pressure attitude. The thing that impressed me the most was after hearing a few of your selling anecdotes, you sold my house almost identically to one of those stories. I chose to use your services because I felt you knew the business and were a straight shooter. I couldn't have been more right! I tried selling the house myself on Grape Vine for a month without any success. It was taxing on us dealing with random agents and buyers who weren't really interested.Alvina and Danny took over and provided an exceptional service. We got more viewings in a week than we had in a month on Grape Vine. By the third week we got an offer which they negotiated really well on our behalf. They definitely over delivered without making us feel overwhelmed through out the entire process. I will highly recommend them to my friends and family. I have dealt with other agents in the past and Alvina far exceeded their approaches and efforts. She got the job done with her positive energy, consideration of shift schedules, respectful communications and even removed scented products to which I am sensitive prior to meetings. She did not give orders, but made suggestions and backed them up with reasoning, which was very refreshing. Alvina and her partner, Dan, complement one another very well and even helped prepare the house for the first showings. They provided professional assistance when required and support during the negotiation process as well as after the sale with details that needed attention. Alvina gave her all and got results. 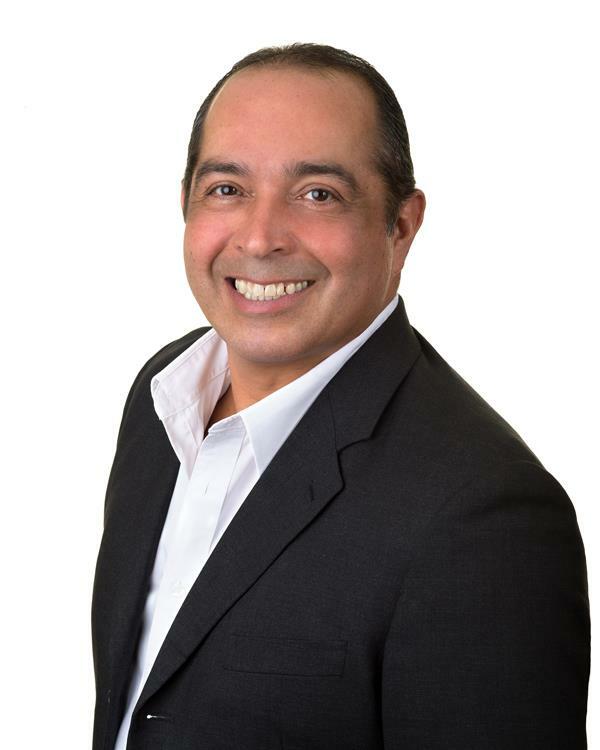 We would like to thank you and Danny for the exceptional service, immeasurable patience and readiness to assist at any time while working on finding a new home for our family and selling the old one. We have never heard of a house being sold in 48 hours and at a price so agreeable to both parties. Just as well, we have not met an agent so attentive and perceptive of clients' needs and concerns. Your negotiating skills helped us greatly when finalizing the new home purchase and setting the selling price of the old home. Your sincerity and honesty helped setting realistic expectations and immediate priorities. Finally, the presentation of our old home was organized in a truly artistic manner while rendering its character without any deviations. We are very pleased and proud to be your clients and will surely bring our friends into your care for all real estate needs. You and Danny are the only agents we know who deliver real turn-key solutions with a VIP-level service. Thanks you for selling our house and finding us our new home. You were always available to answer our questions and update us on current market trends; you were listening to our requirements so well and found us a perfect home. Selling home can be stressful but you made it feel easy. We had such a great experience of working with you! We would recommend your services to all our friends and family, knowing that they will be in excellent hands of professional Real Estate Agent that they can trust. After 3 month of my house being on Grapevine with no offers, Alvina came in and sold the house within 26 days in the middle of the winter! She was a pleasure to work with nad made sure I was satisfied with the final offer. SHe showed great professionalism and I was happy to have her on my side! 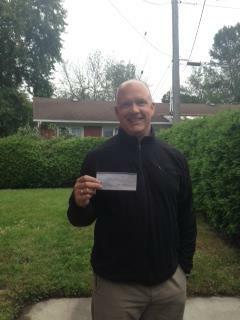 Because of your tremendous support and professionalism it's been an enjoyable home sale experience for me. I'm especially thankful for your updates and constant communications. It's made everything easy and worry free. Most of all, you are so trustful...I totlly relied on you and your advice. 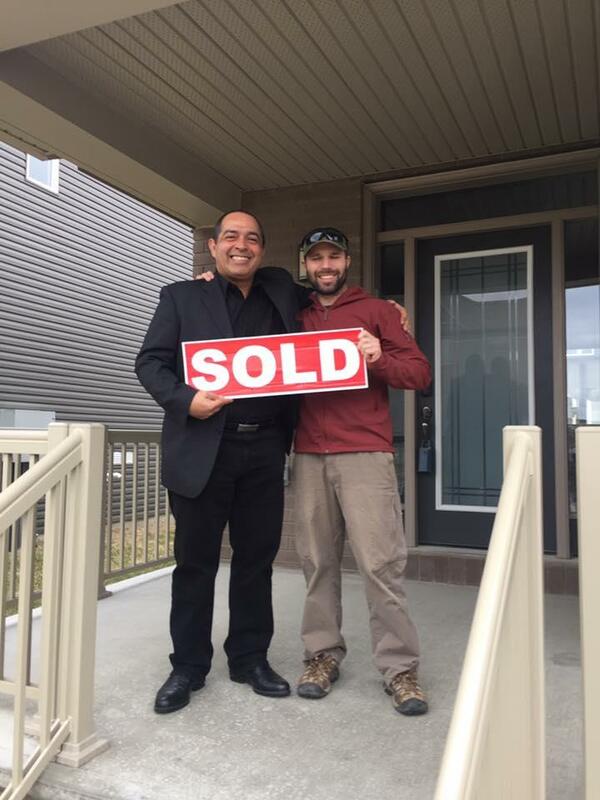 Thank you so much again for everything especially for selling my house 342 Amici Ter in only 28 days. I wanted to send you a quick note to thank you for all your help with selling our house. As you know, he had listed our house on Grapevine for over 300 days without selling the house. The process was time consuming and frustrating. Once you agreed to help is to sell our house, it was as if a great pleasure was lifted from our shoulders. YOur communication and professionalsism were great and you were always available for us. Your knowledge and capability were very clear. As proof , you sold our house within 40 days- and for the price we wanted! We appreciate all that you've done for us. We won't hesitate to use your services for our next house! I just wanted to touch base with you to thank you formally. I don't usually do this, but in this instance, I felt it absolutely necessary. You have, for me, made the process of buying a house stress free...well as much as it can be. First and foremost, thank you for your wonderful attitude. Your energy is infectious and it made the huge task of finding a house more of an adventure. Then, there's your real estate knowledge, which really impressed me and was also responsible - I'm sure - for avoiding much unnecessary searching. My situation wasn't an easy one. I had very specific criteria as to what I needed...well wanted...and as you know, a very short timeline. Even with the short timeline, you were able to arrange over 30 houses for me to view. At first I thought it an impossible feat, but you arranged the viewings brilliantly, so that we could maximize the viewings in the limited time that I had available. Of course, all your knowledge and effort worked out to see my family in a wonderful new home. I've made sure to share your name and our success with family and friends that have real estate needs. For your attitude, energy, knowledge and commitment, thank you Alvina. Thank you, Thank you, Thank you! Words can't express how thrilled we are selling our home in 1 day after listing. We are so glad to have an agent who listened, knowlagable and resourceful. Your knowledge of the market gave us immediate results and we couldn't believe that we sold our condo $500 below listed price. Your professional services are top notch. Thank you very much for everything you did for us. We are very happy with you as our agent. You helped us out a lot, when we needed your help, you were always there. We are very grateful that you helped us sell our house. 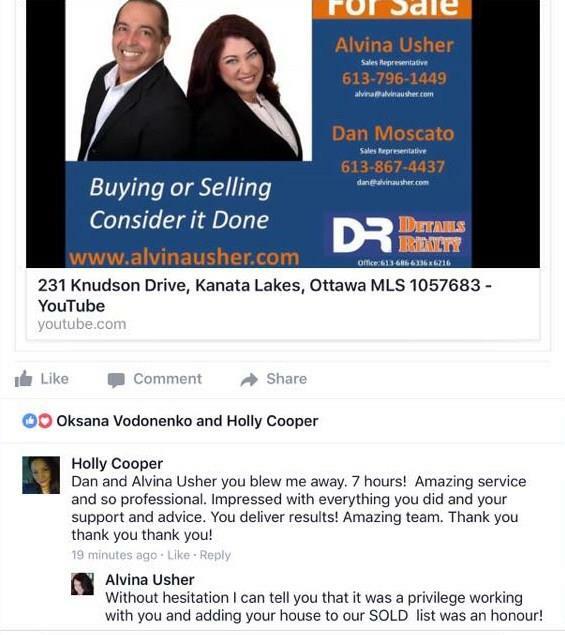 Selling my home was a very stressful task - until I finally hired an exceptional real estate agent named Alvina Usher. Alvina was much more knowledgeable and dedicated to selling my house than any of the other real estate agents I worked with previously. She worked hard to understand my needs, provided thoughtful and beneficial options for me to select, designed an amazing virtual tour, and, most of all, was determined to successfully meet my goals which included selling my house quickly. 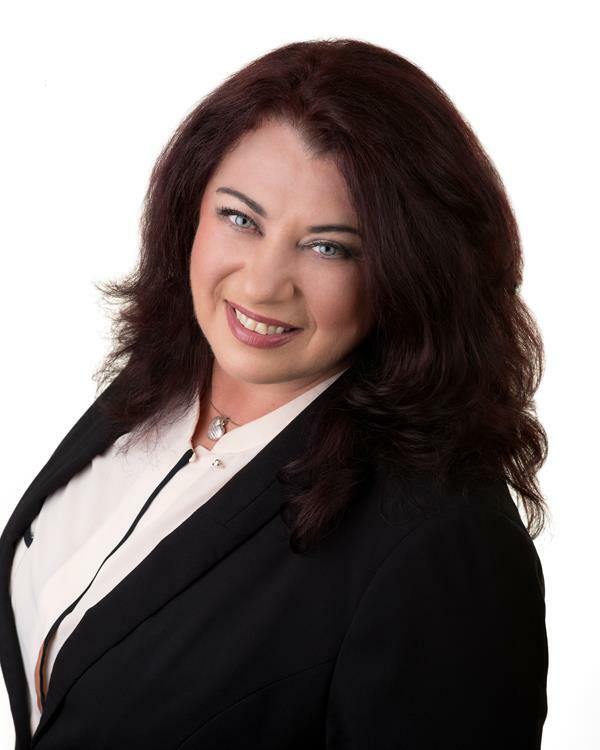 With her outstanding personalized service, her superb financial knowledge and experience as well as her excellent marketing knowledge and experience, Alvina developed and provided me with a thorough and accurate detailed market analysis to finally set a realistic price which closed the sale of the house within just 19 days! Alvina simplified my home selling process and made it a success. It was a pleasure working with her. professional to represent them throughout their complicated home selling process. We want to thank you for all your effort, energy, and help we've gotten during the uneasy time of selling our house and buying a new one. We know we were not easy customers in selling and very picky in buying. And thanks only to your patience and expertise we achieved our goals during a short period of time - just after 2 month on the market our house was sold at the best price we wanted. Then our buying a new home epopee started, we had a pleasant time with you and Dan browsing around different areas to find the dream home for us. And we had found it after seeing more than 40 houses. Thank you Alvina for all your time, and special thanks to Danny for his priceless advice. I just saw the listing of my house. WOW you both did a fantastic job with it. I cannot believe it is my house. Thanks to Alvina's patience we found our perfect home. She is very professional, client-oriented and a hard worker. We would recommend her services to anyone. "Alvina Usher was an excellent Representative. 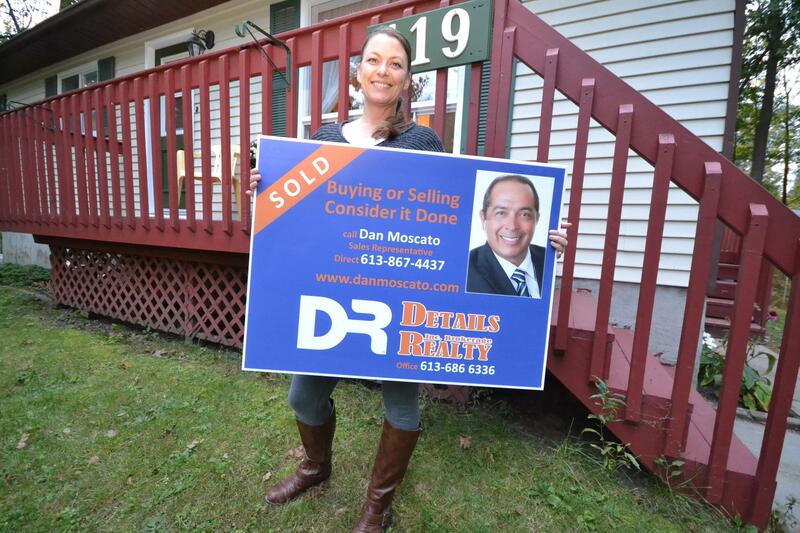 She was a pleasure to work with and understood what we needed to learn to sell and buy our homes. 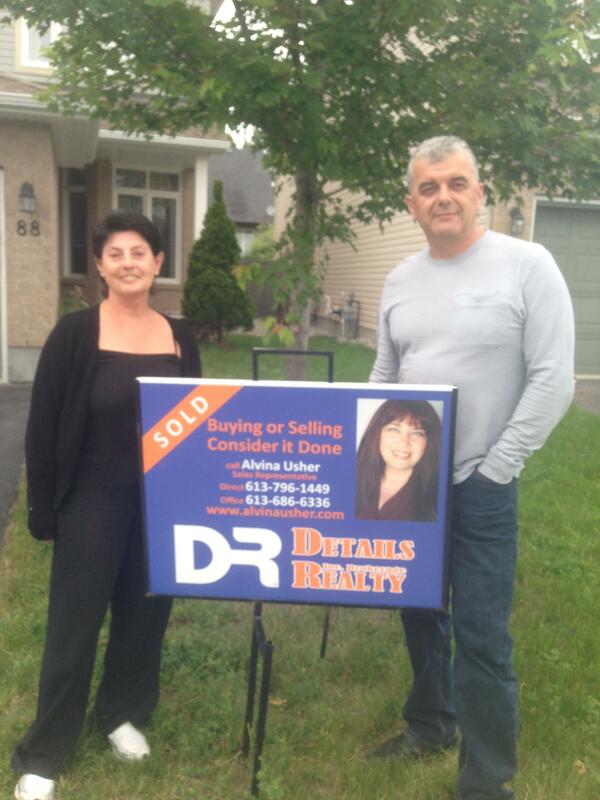 She was able to sell our home at a high price, well still being able to buy us our dream home with-in our budget. We recommend Alvina Usher to be everyone's Real Estate Representative." I really wanted to thank you so much for helping me find my first home. I can’t even believe how quickly it happened! I was instantly set at ease from the moment I met you. I felt that you were so knowledgeable about all aspects of buying a home, as well as knowing about the market in the area I chose to buy. Being a first-time home buyer and being that I was doing it on my own could have been very stressful for me but it turned out to be one of the best, most exciting experiences of my life. There wasn’t one moment that went by that you didn’t explain exactly what would happen next, or advise me on what I needed to do. It was all so new to me and you just made it easy. I really appreciated how involved you were, not only with finding me the perfect house, but also with making contact with lawyers and home inspectors to line up appointments for me, you went above and beyond. You were always available and so easy to communicate with. I would highly recommend you to anyone I know looking to buy or sell a house. I felt you always had my best interest at heart so thank you again. Words cannot describe how lucky I was to work with Alvina Usher. I would highly recommend her to everyone. The reason for all her great reviews , is that she treats you like her one and only client. Your concerns are her concerns, and she works incredibly hard to make things go smoothly and the way that you want. Emails and phone calls are answered very quickly and thoroughly - you will never be left wondering what is happening. Alvina is a consummate professional -- knowledgeable about the market, savvy about pricing and negotiation strategy, detail-oriented with the paperwork, and gracious throughout the process. I really can't imagine getting any better service than this. Believe it - you will be very happy if Alvina is your agent. It is my pleasure to recommend Alvina Usher as a top real estate agent who helped us to get our home sold. She always tried her best and was ready with excellent advice to get us the best deal on the house. We recommend her for her expertise, experience and integrity.